The present study is the first to investigate the relationships between a multiple set of paranormal beliefs and the acceptance of evolution, creationism, and intelligent design, respectively, in Europe. Using a questionnaire, 2,129 students at secondary schools in Vienna (Austria) answered the 26 statements of the Revised Paranormal Belief Scale (R-PBS) and three statements about naturalistic evolution, creationism and intelligent design (ID). The investigated Austrian students showed an average R-PBS score of 82.08, more than 50% of them agreed with naturalistic evolution, 28% with creationism, and more than a third agreed with ID, the latter two closely correlated with each other. Females generally showed higher belief scores in the paranormal, creationism and ID. The agreement with naturalistic evolution correlated negatively with religious belief, but not with other paranormal beliefs, whereas the two non-scientific alternatives to evolution significantly correlated with both traditional and paranormal beliefs. Religious belief showed a significant positive correlation with other paranormal beliefs. All subscales of paranormal belief decreased during the eight grades of secondary school, as did acceptance of creationism and ID. However, the acceptance of naturalistic evolution did not correlate with age or grade. Possible reasons and implications for science education and the biology curriculum at Austrian secondary schools are discussed. The original questionnaire of the revised Paranormal Belief Scale by Tobacyk (2004). Principal component loadings for our 29 questionnaire statements, based on a sample size of 2,129 secondary school students. The highest correlations between single statements and principal component axes are given in bold. An asterisk shows the statements originally belonging to one subscale. The principal components confirm the R-PBS subcales, except for statement 1 (“the soul continues to exist”, originally supposed to belong to the subscale “traditional religious belief”), which showed a closer relationship to the subscale “spiritualism” in our sample, and for statement 23 (“mind reading is not possible”), which loaded more closely upon the subscale “precognition”. Both the statements 25 (“it is possible to communicate with the dead”) and 20 (“there is life on other planets”) did not significantly load upon one of the seven principal components. Principal component (PC) 1 (12% of variance) was equivalent to subscale “traditional religious belief”. PC 2 (10.1% of variance) was equivalent to subscale “witchcraft”, PC 3 (9.8% of var.) to subscale “precognition”, PC 4 (8.5% of var.) to subscale “superstition”, PC 5 (8.3% of var.) to subscale “Psi”, PC 6 (8.3% of var.) to subscale “spiritualism”, and PC 7 (5.7% of var.) to subscale “extraordinary life forms”. Remarkably, all three statements on evolution cohered with PC 1: “ID” and “creationism” correlated positively with PC 1, and “naturalistic evolution” correlated negatively with PC 1. BGBl II Nr 133. (2000). Änderung der Verordnung über die Lehrpläne der allgemeinbildenden höheren Schulen. Vienna: Print Media Austria AG. Available at http://ris.bka.gv.at/Dokumente/BgblPdf/2000_133_2/2000_133_2.pdf. BGBl II Nr 277. (2004). Änderung der Verordnung über die Lehrpläne der allgemein bildenden höheren Schulen. Vienna: Print Media Austria AG. Available at http://ris.bka.gv.at/Dokumente/BgblAuth/BGBLA_2004_II_277/BGBLA_2004_II_277.pdf. FOWID (Forschungsgruppe für Weltanschauungen in Deutschland). (2008). Religionszugehörigkeit, Deutschland. Bevölkerung 1950–2008. Available at http://fowid.de/fileadmin/datenarchiv/Religionszugehoerigkeit_Bevoelkerung__1950-2008.pdf. FOWID (Forschungsgruppe für Weltanschauungen in Deutschland). (2005). Evolution/Kreationismus, Befragte ab 14 Jahren. Available at http://fowid.de/fileadmin/datenarchiv/Evolution_Kreationismus_Deutschland__2005.pdf. GfK Austria. (2009). Einstellungen der ÖsterreicherInnen zur Evolution. Available at http://www.oeaw.ac.at/shared/news/2009/pdf/pk_presseunterlagen_web.pdf. Huntley, C., & Peeters, T. (2005). Paranormal beliefs, religious beliefs and personality correlates. Available at http://www.ethesis.net/paranormal/paranormal_contence.htm. Illner, R. (2000) Schülervorstellungen auf die Akzeptanz der Evolutionstheorie. Dissertation, BIS Carl von Ossietzky Universität, Oldenburg. Available at http://oops.uni-oldenburg.de/frontdoor.php?source_opus=421. Johannsen, M., & Krüger, D. (2005). Schülervorstellungen zur Evolution—eine quantitative Studie. IDB Münster—Ber Inst Didaktik Biologie, 14, 23–48. Available at http://miami.uni-muenster.de/servlets/DerivateServlet/Derivate-3152/Krueger.pdf. Junker, T. (2007). Schöpfung gegen Evolution—und kein Ende? Kardinal Schönborns Intelligent-Design-Kampagne und die katholische Kirche. In U. Kutschera (Ed. ), Kreationismus in Deutschland. Fakten und Analysen (pp. 71–97). Münster: Naturwissenschaft und Glaube 1, Lit-Verlag. Available at http://www.thomas-junker.homepage.t-online.de/pdf/07tjks.pdf. Krainer, K., & Müller, R. (2010). IMST. In Austrian Federal Ministry for Education, Arts And Culture (Ed. ), Austrian Education News (pp. 1–4). Wien: BMUKK. Available at http://www.bmukk.gv.at/medienpool/19219/aen_10_01_61.pdf. Lemay, M., Fricker, S., Galesic, M., Tourangeau, R., & Yan, T. (2009). Effect of interview pace and items position on satisficing. Annual meeting of the American Association For Public Opinion Association, Fontainebleau Resort, Miami Beach, FL. 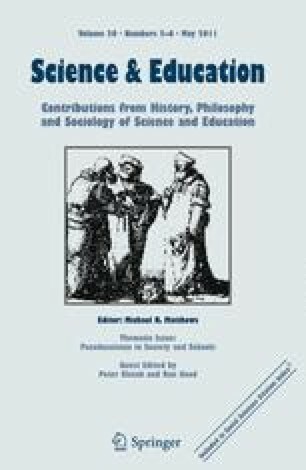 Available at http://www.allacademic.com/meta/p16698_index.html. Schiemann, S. (2010). Socioeconomic status and beliefs about god’s influence in everyday life. Sociology of Religion. doi: 10.1093/socrel/srq004. Schönborn C (2005) Finding design in nature. The New York Times. Available at http://www.nytimes.com/2005/07/07/opinion/07schonborn.html?_r=1. Schwabe, M., & Radinger, R. (2010). Bildung in Zahlen 2008/2009. Schlüsselindikatoren und Analysen. Wien: Statistik Austria. Available at http://www.statistik.at/web_de/dynamic/statistiken/bildung_und_kultur/publdetail?id=5&listid=5&detail=560.